Shri Raam ~ Amazing ..!! Lord Shri Raam , a name which stands not only for signifying a god but also showing us a role model in humans. Though he is a god and king in this avatar , He stood against many problems across his life and had shown every human how not to loose confidence in life. The way he lived, showed us a way to live. The way he ruled his people, shows a way for good ruler. The character he had towards family, his guru's and even to the enemies shows us a principled life of him and thus becomes a role model to the entire human kind. Today Shreeram Navami is celebrated on the birth of Lord Shree Raamachandra. He is the seventh avatar of Lord Vishnu among the Ten. He is born to the King Dasarath and Kausalya on the Chaitra Sudda Navami in karkataka lagna with punarvasu 4th Pada. According to Valmiki, it was before BC 2055. This festival is celebrated for 9 days, starting from Chaitra Sudda Padyami and ends on Chaitra Sudda Navami. By chanting the Shree rama nama, Bhaktas say they see many positive changes in life. 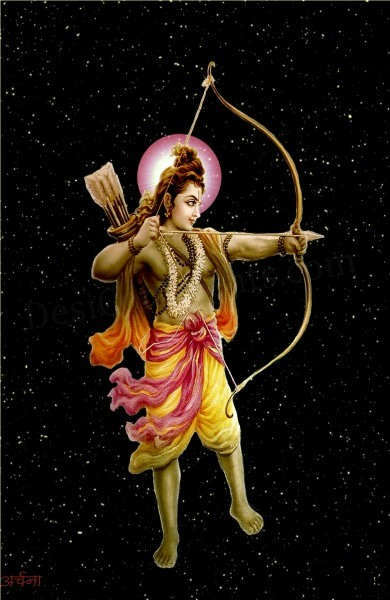 Lord Rama, prince of Ayodhya, is the elder of the four sons of King Dasarath. He was loved the most by his father and all people of kingdom. He has won the hand of the beautiful princess Sita , daughter of king Janaka in Swayamwaram after boldly lifting the Bow of Lord Shiva. Later all the three sisters of sita were also married with the other three brothers of shree rama. On a day, King Dasarath announces the ceremony of making Shree ram the king of Ayodhya but was exiled with sita and his brother Laksmana for 14 years through the plotting of his stepmother. Shree ram's mother - kaikeyi was given with a word from king dasaratha in a war towards her help where she decides to use that word in future when she really needs. Now during Shri Rama pattabhishekam she uses that word and asks the king to make her son Bharatha the King of Ayodhya, which the king cannot deny and hence becomes sick and later dies when Lord Shree Raam leaves the kingdom on his word. Lord shreeram makes his journey across the Dandakaranyam and builds his house in it. In the forest Sita was abducted by Ravana, who was defeated by shree ram in the Sita Swayamwaram .Lord Shree Rama gathered an army of great warriors Hanuma, Sugreeva, Angadha, Jambawantha etc., and sends to search for her. As the army is of animals- monkeys, bears. They very soon find the traces of Seeta devi in Lanka. Lord shree ram wishes to build a bridge for his army to reach the place Lanka from India. 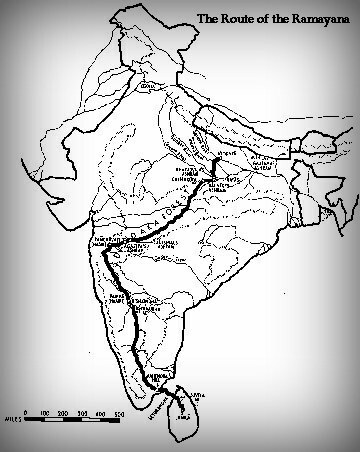 The allies attacked Lanka, becomes succesful in killing Ravana, and brings Sita back. Later Shree rama was made the king of ayodhya and his people doubts sita for her chastity. Shree ram sents his wife to jungle where she gives birth to Lavakusa( Twin Brothers). Later to it she proves her chastitty by entering into fire, but was vindicated by the gods and restored to her husband. 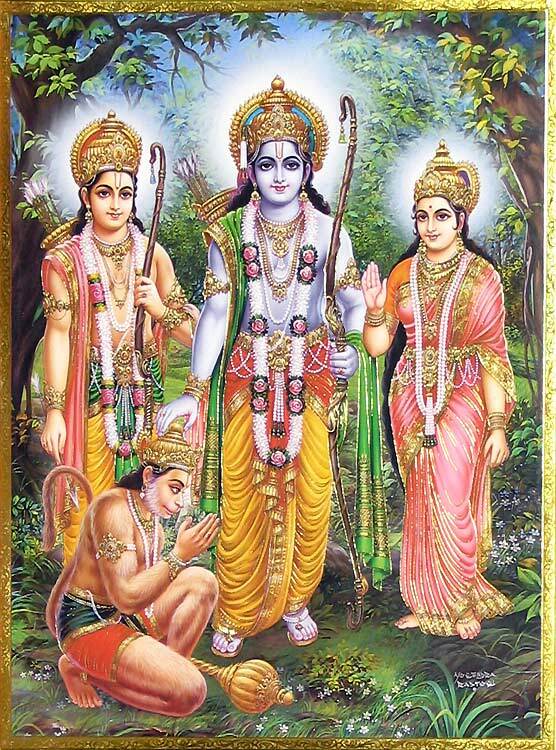 After the couple's triumphant return to Ayodhya, Rama's righteous rule (Ram-raj) inaugurated a golden age for all mankind. 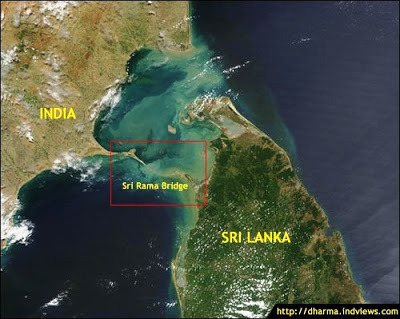 The bridge built by the apes in Ramayanam still exists and known as Rama Sethu. The satellite view of it is here. The Ramarahasyopanishad says that the letters ‘Ra’ and ‘Ma’ are the essence of the two most important Mantras, viz., Ashtakshara and Panchakshara, which, when the letters ‘Ra’ and ‘Ma’ are removed from them, respectively, not only lose their primary meaning but give the opposite meaning. When Ram Nam is chanted, a significant change takes place in the entire organism of the person chanting it. There is a twofold effect product by the utterance of the Divine Name. The Mantra Sakti or the power generated by the juxtaposition (dictionary meaning: The act of positioning close together) of the letters of the Mantra and by the utterance of the same, the whole nervous system of the chanter of the Mantra is set in vibration—a vibration which brings about rhythm, harmony and equilibrium in it. When the nervous system is in such a harmonized state, the breath, too flows rhythmically and the mind rests in a state of tranquillity. It is in this peaceful state of the mind that the divine Consciousness is reflected and the supernal joy of the Eternal is experienced. 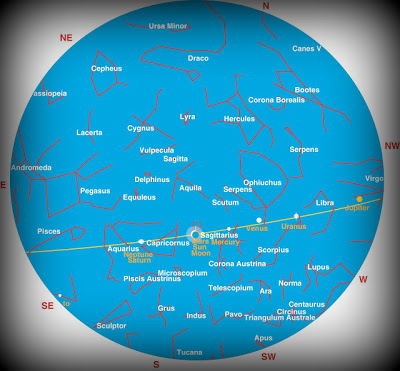 The analysis by Prof. Vartak and Pushkar Bhatnagar has shown that there did exist a certain point in time when the planetary configuration mentioned at the time of Lord Rama's birth did indeed exist and thus, has shown us that the numerous astrological references in the Ramayan are not imaginary but refer to actual points in time.